During your lunchtime forays to the College’s cafeteria or deli, you may have noticed the absence of an evil white substance that lurks in many fast food restaurants – not to mention in the boxes that your BlackBerry, iPad etc. came in. That’s right. We’re talking about polystyrene, aka Styrofoam. About three years ago the College decided to do away with polystyrene and switch to a take-out container that doesn’t take 100 years to break down in the landfill. The cafeteria’s clam shell containers – generally used for hot foods – are now made of sugar cane paper, which is made from “bagasse,” a by-product of cane sugar. Bagasse is both a renewable resource and is compostable to boot. Most of the cafeteria and deli’s new plastic food containers are now BPI (Biodegradable Plastics Institute) certified. This means they’re made with recycled plastic and are compostable. 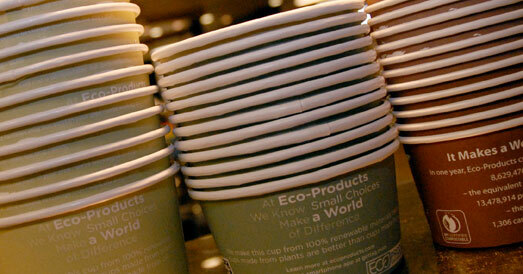 The soup cups and coffee cups as are also made from a renewable, compostable material. Even the oil from the cafeteria’s deep fryers is picked up by a recycler. At present there is no collection area at the College for compostable products (including food), but it’s not out of the question that one day you’ll be able to compost your leftover salad right on campus. Recycling is important, but don’t forget to try and reduce the amount of waste you produce. Plan meals carefully so you don’t end up with a fridge full of food that doesn’t get eaten. Don’t go grocery shopping on a empty stomach. If you have a yard, make or buy a backyard composter to compost your fruit and veggie scraps, eggshells, tea bags and coffee grounds. If you live in a house, take advantage of curbside food scraps collection. Most cities in the Lower Mainland offer it. If you live in an apartment, consider getting a worm composter. Or ask your local community garden if you can put your kitchen scraps in their compost bin. Bring your own reusable containers to restaurants for take-out. When shopping, choose products that come in glass or aluminum containers, as both materials are infinitely recyclable. For plastics, keep in mind that Metro Vancouver recycles nos. 1, 2, 4 and 5 only. For more information on what you can and can’t recycle, plus organizations that will take things the Blue Box doesn’t, visit your municipality’s website. See our post last week on the College's green roof. Come celebrate EVENT's 40th Oct. 26! What do you do when an earthquake hits?